Tokyo, Japan—Sony Corporation today announced the upcoming release of the IMX586 stacked CMOS image sensor for smartphone cameras. The new sensor features 48 effective megapixels*2, the industry’s highest pixel count. *1 The new product achieved a world-first*3 ultra-compact pixel size of 0.8 μm, making it possible to pack 48 effective megapixels*2 onto a 1/2-type (8.0 mm diagonal) unit, thereby supporting enhanced imaging on smartphone cameras. These days, high-end smartphone models require even greater imaging quality from their cameras. The new Sony sensor features 48 effective megapixels,*2 a pixel count which rivals that of high-performance SLR cameras, making it possible to capture beautiful, high-resolution images even with a smartphone. 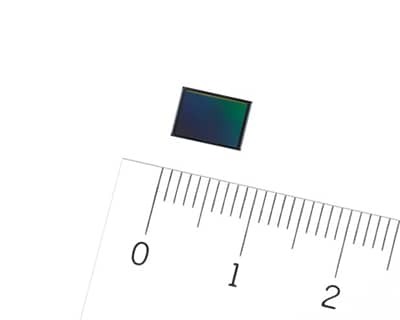 The new sensor uses the Quad Bayer color filter array, where adjacent 2x2 pixels come in the same color, making high-sensitivity shooting possible. During low light shooting, the signals from the four adjacent pixels are added, raising the sensitivity to a level equivalent to that of 1.6 μm pixels (12 megapixels), resulting in bright, low noise images. In addition to these advantages, original Sony exposure control technology and signal processing functionality are built into the image sensor, enabling real-time output and a superior dynamic range four times greater than conventional units. Even scenes with both bright and dark areas can be captured with minimal highlight blowout or loss of detail in shadows. Generally, miniaturization of pixels results in poor light collecting efficiency per pixel, accompanied by a drop in sensitivity and volume of saturation signal. This product was designed and manufactured with techniques that improve light collection efficiency and photoelectric conversion efficiency over conventional products, resulting in the world’s first*3 0.8 μm pixel size, with both high sensitivity and high saturation signal level. This smaller pixel size allows the new product to deliver 48 effective megapixels*2 on a compact unit with 8.0 mm diagonal, which can be fitted on many smartphones. The increased pixel count enables high-definition imaging even on smartphones which use digital zoom. 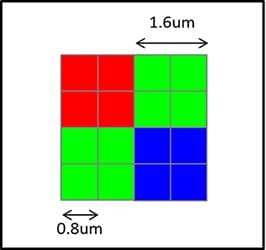 By adopting the Quad Bayer color filter array, where the adjacent 2x2 pixels come in the same color, the new sensor delivers both high sensitivity and high resolution. In low light situations, such as shooting at night, the signal from the four adjacent pixels are added, raising the sensitivity to a level equivalent to that of 1.6 μm pixels (12 effective megapixels), to capture bright, low-noise photos and videos. When shooting bright scenes such as daytime outdoors, the built-in, original signal processing function performs array conversion, making it possible to obtain high-definition 48 effective megapixel images in real time. Original Sony exposure control technology and signal processing functionality are built into the image sensor, enabling real-time output and a superior dynamic range that is four times greater than conventional products. Even scenes with both bright and dark areas can be captured with minimal highlight blowout or loss of detail in shadows while viewing the image on the smartphone display.